Just three miles from the San Diego Cruise Terminal, this hotel offers complimentary shuttles to the terminal. Just two miles from the Del Mar beaches, this hotel features a resort style swimming pool with hot tub and kiddie pool. This downtown hotel features an outdoor pool and hot tub and Hazelwood's Cafe where kids eat free. Located on the Harbor Island waterfront, this hotel offers rooms with balconies overlooking the bay and marina. This Rancho Bernardo business hotel offers easy access to many local businesses including Northrop Grumman and HP. Set in the Mercardo Business Park, this business hotel offers convenient access to many businesses including Siemens. Just two miles from Sea World, this Old Town hotel features an outdoor pool and hot tub and on site coffee shop. Five miles from the airport, this hotel features family suites with bunk beds, heated pool and courtyard with fire pit. 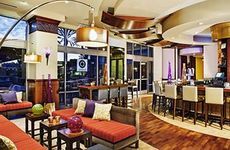 Located in the Sorrento Mesa business district, this hotel offers easy access to the San Diego Tech Center. Located near the Wild Animal Park, this hotel offers complimentary shuttle service to businesses within five miles. This Old Town hotel offers convenient access to area businesses like Raytheon and tourist attractions such as Sea World. Located in Kearny Mesa Business Park, this business hotel offers an outdoor swimming pool and hot tub. Located in the foothills of the Black Mountains, this hotel features tennis courts, golf course and a croquet court. This extended stay hotel offers a complimentary breakfast, outdoor BBQ and picnic area and ping pong tables. Located on San Diego Bay at the tip of Shelter Island, this resort offers a relaxing retreat minutes from downtown.